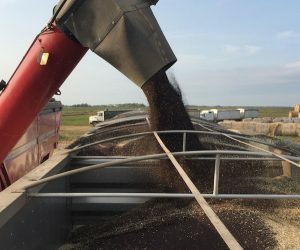 Some canola growers have reported rising temperatures in their canola bins. Growers are encouraged to check all canola bins as soon as possible. Heating can start small and go unnoticed for days and perhaps weeks. Cooling the bin and stopping this early heating now can save a lot of money in lost grade and lost delivery options. Where did 2017 yield come from? Where did the yield go? What were the key driving factors behind very good yields in some areas and poor yields in others? Agronomists, farmers, researchers, extension staff, students and anyone else interested in canola research, innovation and industry updates are welcome to attend the three-day “Canola Week” conference in Saskatoon, December 5-7. Choosing events: What do you need to learn this winter? Farmers and agronomists have many opportunities this winter to learn through live presentations, Q&A sessions and conversations with experts. The following events have strong canola themes and CCC agronomy specialists will be speaking at many of them…. Canola variety decision-making for 2018 should include a flip through the new Canola Variety Selection Guide: Featuring CPT Summary Data. 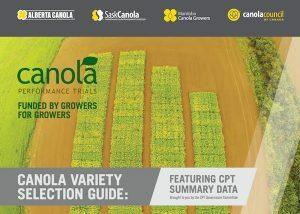 It can be downloaded from the Canola Performance Trial (CPT) website to your phone, computer or tablet for easy reading. With each canola seed decision, growers face this question: Would a seed treatment upgrade to improve management of flea beetles and cutworms provide a return on investment? A review of flea beetle and cutworm scouting notes from the past few years will help with this decision. Growing a clubroot-resistant variety is an important step in clubroot management for farms with clubroot, for farms in a county, district or municipality with clubroot and for farms adjacent to an area with clubroot. Winter is a great time to review yield results, fertilizer rates and potential fertilizer shortcomings evident over the growing season. Winter provides the time to look at soil test results from the fall (and even sample fields that weren’t done sooner – albeit with specialized equipment for frozen soil) and make plans to pre-buy and maybe even take delivery of fertilizer – if the farm is set up for that. But winter is not the time to apply fertilizer.